Eh! Oh! It’s the Teletubbies! When Roo was just a baby we were lucky enough to receive a number of books as gifts for her. After all, the gift of reading is one of the greatest gifts we can give our children. Within this selection of books, she had a range of Teletubbies books which we read time and time again. 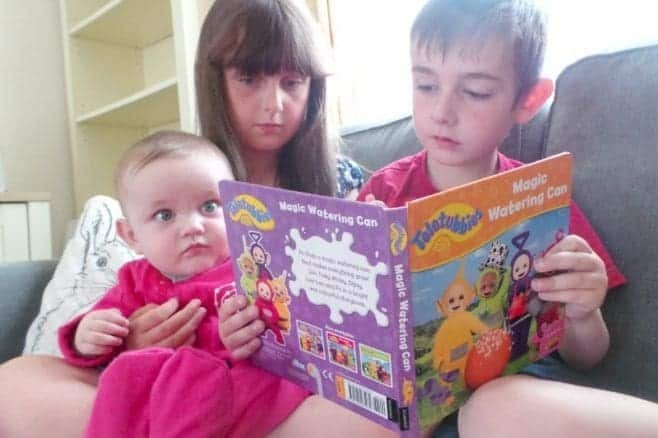 With the new series of Teletubbies making its way back onto our TV screens last November it has once again become a household hit and we have relived memories of the episodes we watched with Roo and Tigger when they were younger and passing the baton down to little Piglet. Say Eh-oh to Tinky Winky, Dipsy, Laa-Laa, Po and their friends in this Teletubbies Pocket Library. 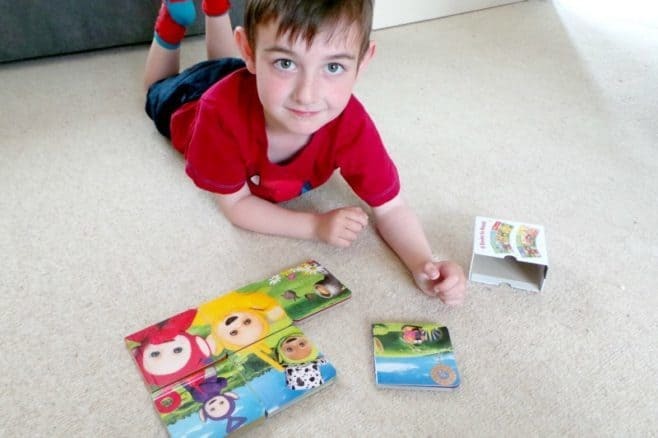 With six durable board books in a smart slipcase, each containing colourful images of everyone’s favourite Teletubbies characters. 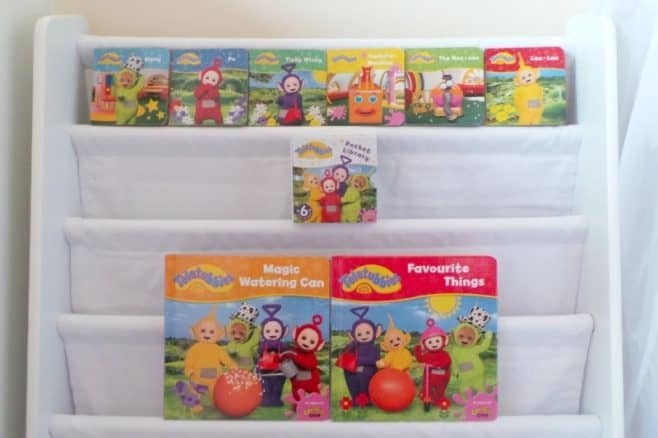 The six books each have a different picture on the back and form a puzzle which when put together shows a lovely scene of all the Teletubbies together. Tigger especially loved getting hold of the books and putting the books together to make the picture. Piglet, however, enjoys trying to munch on the books whilst nobody is looking. Thank goodness they are made of a good quality board or she’d be supplementing her diet on paper. Tinky Winky, Dipsy, and Po all have their favourite things to play with but Laa-Laa has lost hers Can the others help her find it? Young Teletubbies fans will love this bright and colourful storybook that’s ideal for reading and sharing together. Roo always loves to read to Piglet, with Piglet always happy to sit with her and listen (albeit she is usually trying to grab the book from her). 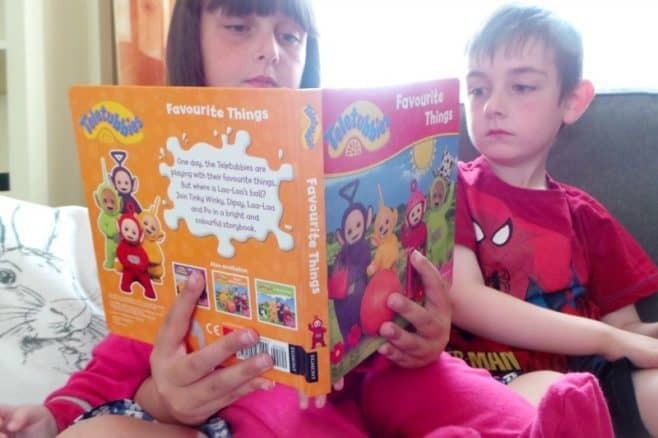 Watching them together reading the favourite things book brings a smile to my face as Roo is sharing one of her favourite things with Piglet – reading. Po’s watering can is magic and everything she waters with it grows and grows. Young Teletubbies fans will love this bright and colourful storybook that’s ideal for reading and sharing together. I love to watch Tigger reading this story, I find it hard to believe that he only started reading in September. The Magic Watering Can is a story that he giggles at every time he reads it. As Po wanders around Teletubbies Land sprinkling his magic watering can, everything he sprinkles suddenly grows, with Laa-Laa’s hat the one that Tigger loves the best. With two older siblings who like to read Piglet is really quite lucky in that she always has someone to sit with her and read her a story. More often than not, one will start reading and the other will come over and want to listen too – makes my heart melt. 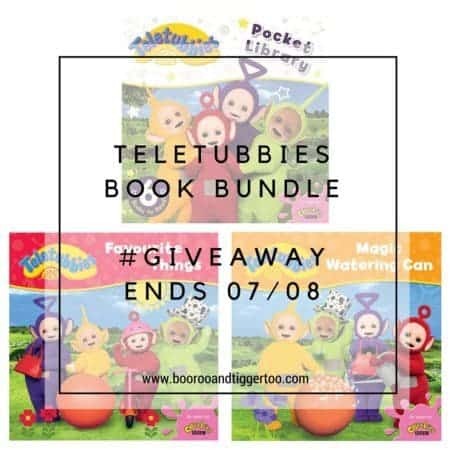 To celebrate the release of the new Teletubbies books from Egmont, Boo Roo and Tigger Too are lucky enough to have a Teletubbies book bundle (includes Pocket Library, Teletubbies: Magic Watering Can and Teletubbies: Favourite Things books) to giveaway.